With Record Breaking Sales in 2006 and continued strength in the current market, there have been over a half-billion dollars in completed transactions to date at the Trump International Hotel and Tower at Waikiki Beachwalk. The project boasts 462 ultra-luxury suites ranging from studios to residence style 5-bedrooms, making 38 story gem the new benchmark for luxury in Waikiki. The desirability and ongoing success of the Trump Tower Waikiki are testament to the quality of the individual units, combined with the exceptional services offered and the unparalleled location in the heart of Waikiki. As the newest, fee-simple luxury building in Waikiki, Hawaii 5-0 Properties, Inc. understood from the beginning the unique value the Trump International Hotel and Tower would hold for both local and international real estate investors. In partnership with Jack Tyrrell and Company, Inc., Hawaii 5-0 secured top buying slots for the purchase of 27 units, for a over $40 Million dollars in sales in the initial one day sell out of the project in 2006. Since, they have been responsible for representing buyers and sellers in numerous re-sales since the project's completion in late 2008. Trump International Hotel and Tower Waikiki Beachwalk is one of the few Fee-Simple premium properties in Waikiki, and offers the only full service hotel condominium residences built in Waikiki. 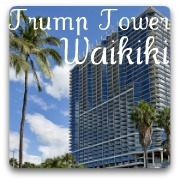 Contact our Trump Waikiki Specialist or call us at 808.971.7711 for more information on buying or listing a Trymp Tower Property.